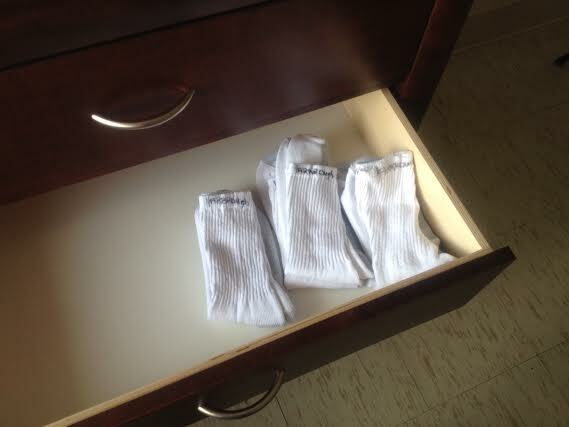 My dad’s socks in one of his dresser drawers at the manor. His last name is written in marker on the top. It’s sad how a senior facility, for some, is the last place they go. And in it, you resort back to the way it was when you were a kid at the first place you go: preschool or kindergarten. Your name has to be written on everything that’s yours: socks, shirts, pants. Even my dad’s TV set now has his name written down the side of it in permanent marker. I saw an older lady in the hallway with a purse. Her name was Irene. I knew this from the piece of tape on her purse. In a way, maybe this isn’t so others know who we are or what is ours, maybe it’s so we never forget who we are.